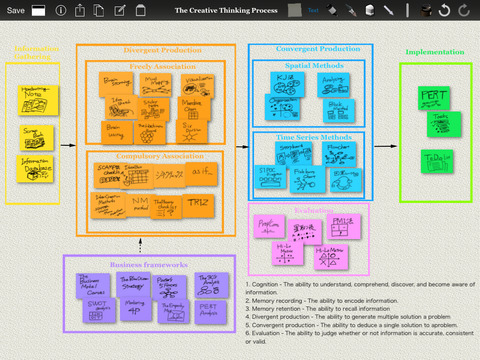 IdeaBoost is a powerful thinking tool designed to match the workflow of your creative thoughts. Its simple and intuitive interface integrates seamlessly with a wide variety of thinking methods.Its main features which include smooth handwritten sticky notes, editable canvases, a variety of frameworks for generating ideas, and real-time sharing with cloud services, will all provide a powerful support for your creative processes. 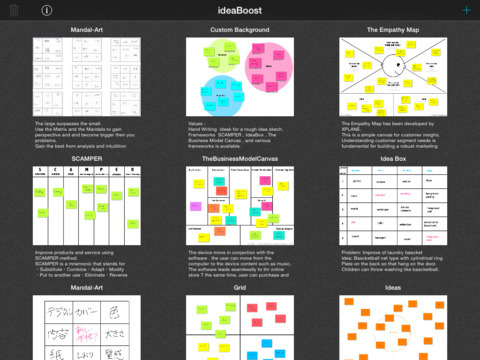 Use IdeaBoost in a variety of ways, for free-range brainstorming using handwritten sticky notes, arranging and managing ideas, generating ideas with different thinking methods and frameworks, online brainstorming, real-time shared whiteboards, and more. Ideal for anyone who needs to generate new ideas, from professionals such as entrepreneurs, project managers, consultants, marketers, advertisers, researchers, teachers, and writers, to students wishing to learn about creative thought processes. 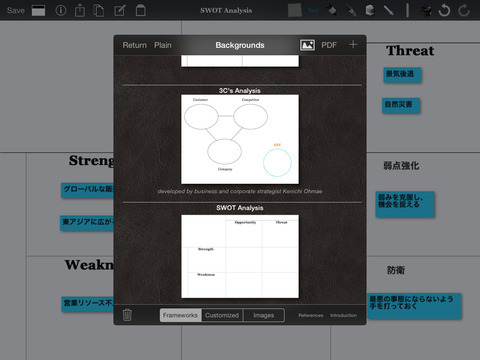 With IdeaBoost, you can use handwritten sticky notes to generate ideas in a stylish way.In creative processes, it is said that it is extremely important to generate a large number of new ideas first and then evaluate them later.This app is particularly useful for the stage where you create a large number of rough ideas using handwritten notes. It also makes it extremely easy for you to arrange and manage ideas by freely categorizing notes by color, adding tags, re-using them, and more. We believe that during the initial stage of the creative process, your brain tends to work more at random, rather than in a straight line, with ideas almost radiating outwards from its center. Writing horizontally on a notebook requires you to move from left to right in the proper order, which goes against this random movement of the brain. By using a sticky note as the starting point and then developing new thoughts as they radiate outwards, we believe that you will be able to generate news ideas more naturally. IdeaBoost offers a wide range of idea generation methods including SCAMPER, Mandala Charts, the Matrix Method, and Phoenix Checklists. It allows you to generate a large number of ideas using a wide variety of thinking methods.In addition, it has a carefully selected range of high class frameworks designed to help professionals with their planning tasks.It includes classic frameworks such as 3C, 5 Forces, and SWOT analysis, to the latest innovative theories such as Blue Ocean Strategy, and Business Model Canvas. The frameworks can be very useful for helping you think of new ideas from a variety of angles, so generating new ideas in line with the frameworks can be extremely effective. Of course, you can also create and save your own framework by writing it on a canvas. You can also import photos or PDF files into the background, providing you with great flexibility. Generally speaking, brainstorming can be more effective when performed as a team; however, good ideas do not only manifest themselves during a meeting. Also, as modern working conditions nowadays allow for more freedom in terms of location, it is not always necessarily the case that all members of a team can be often in one place at the same time. With IdeaBoost, you can create a cloud canvas that can be shared in real time, allowing all team members to brainstorm online. IdeaBoost includes a variety of frameworks which you can use to request new ideas, allowing you to obtain more effective results. Our support site provides an introduction to the basic principles and concrete methodologies in relation to ideas and planning. Even complete beginners can use our support site to learn principles and techniques that they can put into practice using the app. We also recommend it for educational and training purposes.